Provide client approved CMYK files. This will avoid a second interlacing charge for mastering unapproved art due to composition, typos, incorrect color, etc. Include standard 1/8" bleed and image safe areas. Bitmap and/or scanned art should be of sufficient resolution for acceptable reproduction, typically 300 dpi or more. Art can be supplied as a single layered file which will ensure proper alignment and registration between phases. Art can also be supplied as separate files. However, individual phase files should be of the same resolution and dimensions to avoid inter-phase mis-register. Full motion animation footage can be captured from a variety of sources including motion picture film, video, stop motion photography, time lapse photography, computer generated graphices and DVD. However, several rules of thumb should be observed when selecting footage for your project. VHS video typically has a horizontal resolution of less than 425 lines. Digital Beta has typically 525 lines of horizontal resolution, while digital motion picture files can have as much as 4,000 lines of resolution. Bearing these resolutions in mind, digitized motion picture film can obviously be inlarged to much larger dimensions than VHS or Beta before pixilation or artifacts become visibly apparent. Final image dimensions must fit wihin the aspect ratio of the source footage. This directly affects point 1 in this section. An example can be taken from a sports card produced from video source footage. 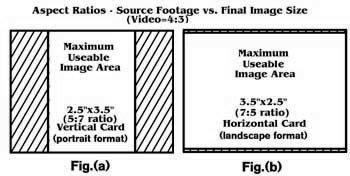 Video maintains a 4:3 aspect ratio while a sports card typically trims at 2" x 3' (vertical portrait format) or at 3" x 2" (horizontal landscape format) for aspect ratios of 5:7 and 7:5 respectively. In this case, one can observe in illustration 4 that figure 4b ecompasses more of the video image than figure 4a - and can be enlarged correspondingly larger than figure 4a (refer to Resolution of source material above) as more pixel data is included in the image. When the camera pans, dollies or trucks with the subject in a manner such that the subject maintians a relatively stationary postition within the composition or frame. Aspect ratio of the final image allows enough top to bottom or side to side room to re-register the individual frames such as that the subject maintains a relatively stationary position within the composition. Unfortunately, this decreases the amount of usable image data and limits the amount of enlargement that can be performed before pixilation becomes visibly apparent. A cycle or cyclic motion can best be described as a sequence where the first and last frames of motion coincide to produce continual motion when looped. Simply, the motion of walking, running, a bouncing ball, yo-yo, or spinning wheel are good examples of cyclic motion.